Competition entries must be received between Monday, August 20 – Friday, August 24. It is your brewery’s responsibility to make sure your entries arrive on time. Entries received at GABF warehouse after August 24 will not be judged. Neither refunds nor credits will be issued for missed deadlines (or beers dropped off after the August 10 refund deadline). Track your package(s) and save all documentation pertaining to your shipment in case there are any issues during transit. Bottles/Cans Only – The GABF requires bottled or canned beer samples for judging and will not judge from kegs being sent to the festival. A note on crowlers: in our experience, beer brands entered in crowlers do not fare well during competition judging due to storage well beyond the intended life span of that package format, oxidation, etc. While crowlers are a completely accept- able format in which to send entries, consider submitting your en- tries in a package format designed to store beer for many weeks. Pack it well (make it unbreakable): No matter how well you think you have packed your bottles for shipment, pack them even better to prevent breakage during shipping! If bottles do break, any replacements must meet the same deadline listed above. Late entries will not be accepted. Send the appropriate (required) amount: See information at top right for amounts. Breweries sending less than the required amount for judging will not have these entries judged, nor will you e issued a credit/refund for your competition entries. Making a change after July 12: Please contact Event Manager Chris Williams at Williams@BrewersAssociation.org to request changes to entries. Not all change requests may be possible due to closed categories, etc. Changes are not final until you receive written confirmation that the change has been made. Decided not to send a beer for the competition? If you decide not to ship one or more of your competition entries, please notify us. Entries not shipped are a common cause of handling errors for your other entries. These are set aside while we search for your “missing” entry or entries. If you plan to sepa- rate shipments for your competition entries, please email Williams@BrewersAssociation.org or call 720-473-7671. Please see the refund policy if you decide not to ship any entered beers. The deadline to make any beer changes is August 10. No beer changes will be accepted after this deadline will be accepted after this deadline, nor any refunds or credits issued. THIS WILL BE YOUR ONLY OPPORTUNITY TO CONFIRM/CHANGE YOUR ENTRIES FOR THE COMPETITION. Number of bottles/cans to be sent for the competition depends on the bottle/can size. Please send no less than the stated amount listed below, based on the bottle size you’re sending. Breweries sending less than the required amount for judging will not have their entries judged, nor will you be issued a credit/refund for your competition entries. *Category-specific quantities: Please know that certain categories may have such a large number of entries that additional rounds of judging are required to judge all entries, meaning that additional samples will be required to be sent for judging in these categories. All categories other than those listed above in the Large Category section above. Clarity and accuracy are key: make sure the info on the label matches the info we have registered for the competition exactly. If the info differs at all, it will cause problems during sorting and judging. 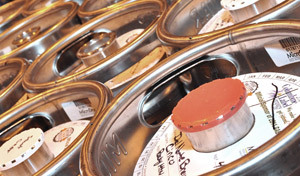 GABF is not responsible for issues caused due to errors in labeling. Please create your own label and affix one label to each bottle with adhesive (adhesive labels, clear packing tape, glue, etc.). Here is a template you may use to create your own labels.. Do not rubber band or string loose paper to the bottles or use clear labels – this will definitely cause issues during sorting. You do not need to remove any commercial labels that are already on the bottle/can. Specialty information and pouring instructions are not necessary on the label (we provide this to judges separately). Please include the following information is included for judging. GABF category number (and subcategory letter, if applicable) and name, if possible. Place all bottles standing upright in the shipping container. All bottles should be placed in the same direction (lids up) wrapped in bubble wrap. Use your standard four- or six-pack holder to help keep bottles secure. Fill the shipping container to the top with packaging materials. Packing peanuts are NOT recommended. If used, make sure peanuts are enclosed in a plastic bag. Wrap the original box in a plastic bag to avoid possible leakage and then place the box in a strong shipping box filled with more packing material. If more than one box of entries is being shipped, be sure to keep the samples of each brand in the same box and to label each box as “box 1 of 2,” “box 2 of 2,” etc.). Do not split bottles of the same brand/entry into separate boxes. Coolers or other special containers will not be returned, however the beers that arrive in specialized containers will be judged and tend to withstand the rigors of shipping. Looking for ways to save money on shipping? Breweries may consolidate shipments when sending competition beers. This saves time and money! Consider contacting your local guild or other nearby breweries to discuss the option of palletizing your competition entries and shipping them together via a freight company, which tend to encounter less issues (loss of shipment, breakage, etc.) than individual shipments sent via UPS or FedEx. A list of participating breweries can be found at GreatAmericanBeer- Festival.com if you’d like to coordinate with others. Please do not use the United States Postal Service (USPS). FedEx, UPS, and private couriers work well, and freight companies work best. When sending beer via UPS or FedEx, it may be best to schedule a pickup from your home or place of business. Often shipments brought directly into a UPS or FedEx store may get denied as shipping alcohol is against UPS and FedEx policy (unless you have a business account that allows for these type of shipments). If you have any shipping issues, please contact Chris Williams at 720-473-7671 or williams@brewersassociation.org. All regulatory and financial burdens associated with submitting samples to the Great American Beer Festival are the sole responsibility of the entering brewery. C.O.D shipments will not be accepted. Please consider sending extra beer or brewery swag to donate to the sorting volunteers who work many hours in the cooler sorting the beers into the competition’s various categories.